Back in 1962, when co-creators Stan Lee and Jack Kirby came up with concept of the green behemoth for Marvel comics known as “The Hulk” it wasn’t necessarily groundbreaking. It was the classic Dr. Jekyll and Mr. Hyde story reinvented in comic book form for an American culture that was already fearful of radiation and nuclear science in the atomic age. Dr. Bruce Banner, the emotionally withdrawn scientist would become the rampaging Hulk when he was accidentally exposed to a Gamma bomb. It’s an event that would forever change his life, isolating himself in a constant state of panic knowing that a lethal monster raged within him. It would seem that a reader would be hard-pressed to find anything to relate to in such a story. I find the opposite true. The Hulk is a raging monstrosity that devastates anything in his path, a senseless creature and subconscious guardian of a fragile psyche that just wants to be left alone. As a child, I often felt misunderstood and unappreciated, so there was an immediate connection as I paged through the comics. Soon I would find myself glued to the television each Friday night when the CBS show premiered in the 70’s. I would run around in slo-mo as Lou Ferrigno did on the show as Bill Bixby’s alter-ego and do a spot-on impersonation of his classic roar all to the amusement of the girls in the neighborhood. Maybe the Hulk, a character who solves problems physically, appeals more to boys but the concept should appeal to anyone who longs to just lash out at whatever oppresses them. Having read many takes on the ‘ol green genes over the years by various writer and artist teams in the comics, I had learned to open to any portrayal. 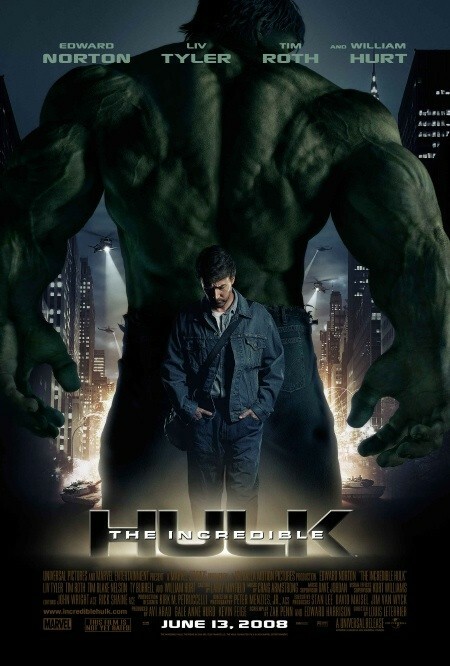 So, when Ang Lee’s 2003 film came out focusing primarily on the psychological drama of the Hulk story, I wasn’t too surprised by the critical lashing it took by both fans and critics. Unlike me, people were just not ready for an indepth study of the emotional scars family dysfunction can inflict. By the time the bright green CGI Hulk showed up, they were already seething in their seats. This wasn’t the Hulk the mass populace knew of from the series or the cartoon yet I respected Lee’s attempt at a more cerebral approach but was kinda turned off but some of the sillier aspects of the film. While it was beautiful to look at and well-acted, I’ll admit there were some flat-out silly aspects to the film that I just could not accept. Then in 2005, Marvel Studios declared that they would start producing films through distributors in order to have more control over their characters and create a clearer, succinct Marvel universe. The first film to be released in this fashion was last month’s “Iron Man” which continues to be an enormous success. Now, we have this film directed by Louis Letterier (“Transporter 2”) which is more a reboot than a sequel. For the record, Letterier and Marvel Studios are not disowning or apologizing for the first film (nor should they) but they have reportedly stated the goal this time was to give the audience a movie they were expecting to see when they saw they first one. But, is it too late? Are moviegoers wondering why another Hulk movie has been made when the other one “tanked”? I know why, it’s called “merchandising”. That’s right. Supposedly, there was enough made from the merchandising for the last film to warrant another film. It’s not odd that a studio would want to redo what didn’t work with a popular property (look at “Batman Begins”), what seemed surprising to me is the short five year gap between the two. You’d think they woulda distanced themselves even more. I guess it doesn’t matter though. This new film indeed delivers the action and storyline that everyone had expected the first one to shell out. It’s a solid blend of stories and characters from the comics and the TV series with the promise of (of course) more action! After a fast-paced opening credits origin sequence channeling the feel of the television series, the story picks up where the first film ended. Banner (now played by Edward Norton), is a fugitive from the U.S. who remains in self-exile in Brazil, where he works at a soda manufacturing company. In an effort to control the beast within, he’s become much more proactive. He’s taken up martial arts and meditative breathing techniques with a local Aikido expert (Rickson Gracie) to help control his emotions, and has not suffered a transformation in five months. Banner also wears a heart monitor bracelet that he cannot let reach over 200, so this guy is thoroughly preventative. But since the title of the movie is his alter ego, we know that we will soon be staring into his green eyes. Banner’s only communication with the outside world is some online contact named “Mr. Blue” (Banner goes by “Mr. Green”) who is apparently attempting to help Banner find a cure for his “condition”. Other than that, he’s cut off all ties with girlfriend Dr. Betty Ross (Liv Tyler) for her safety since she was injured during that first gamma radiaton incident and also cuz her estranged father, General Thaddeus “Thunderbolt” Ross (William Hurt) still considers Banner property of the U.S. army. We know Gen. Ross will find Banner, it’s just a matter of when and how. Unfortunately, just as Banner comes close to a breakthrough he is found by Ross when a drop of Hulk blood shipped to the U.S. in a bottled beverage gets traced back to him. Here’s where the movie gets adrenalized! Ross travels to Brazil with his army goons led by militant career soldier, Emil Blonsky (Tim Roth) who pursue Banner through favela rooftops and wind up trapping him in the bottle factory where he works. Trapped and hounded, it is here where we see Banner’s first transformation after a little provocation from some bully co-workers. These scenes are actually quite effective; the Hulk is lashing from the shadows of the machinery around him as the soldiers close in. When he and Blonsky get a good look at each other right before Hulk makes his escape, it is truly a geek out moment. The CGI animators do a good job using the steam and shadows of the factory to not only give a mysterious feel to the first sighting of the jade giant but also set his mood….he just wants to be left alone. Banner is now officially on the run and that’s okay since he has to hightail it back to the states for some important DNA data that Mr. Blue needs anyway. Good thing his alter ego has frequent flier miles as we see him wake up in Guatemala in his big britches with serious morning after haze. Meanwhile, Blonsky wants the truth from Ross about what the deal is with the large green monster he came across in Brazil while pursuing Banner. Ross explains that the monster is Banner, and that he was created accidentally during an experiment in radiation-resistance that was inspired by World War II military cellular enhancement research. Blonsky appears to know of this research and refers to them as “super-soldiers” (another Marvel nod that shows they’re not only building the current universe but also giving it history) with curious zeal. After what seems a brief trek through Mexico, Banner can now be seen hiding behind campus trees at Culver University. This kind of bothered me, since it would’ve been more interesting to see how a guy wearing nothing but stretched-out, shredded pants can get through the border from Latin America. I can see it now….immigration puts puny Banner in a headlock since he couldn’t conjure an ID. Next thing you know the screen goes all green! Cut to Betty Ross reading a newspaper while sipping coffee at an outdoor cafe near campus with the headline, “Immigration Goes Green!” But clearly this movie, with its smooth pacing, is not stopping for any character-building moments. It’s obvious Marvel Studios wants to just keep the action coming at the expense of any real introspection. Once you accept it the more you can enjoy the story. Much to Banner’s dismay he finds that Betty seems happy dating a shrink named Leonard Samson (Ty Burrell) in his absence. He checks in with an old friend Stanley (Paul Soles), a pizzeria owner, who hooks him up with a place to stay and a job as a delivery driver. Banner uses this job to bribe his way past a security guard (Lou Ferrigno) in order to continue his research in the campus lab. He hacks into Betty’s files only to find that any and all data on his “disease” has disappeared”. Upon his return to the pizza place that night, a surprised Betty sees him and catches up with him later on a bridge as Banner tries to depart in the rain while the “Lonely Man” (from the TV series) theme plays. Betty sneaks her favorite fugitive back to her shack where she reveals that she has his entire DNA data filed away safely. During this time, puny Blonsky seeking both revenge and power has volunteered himself as a test subject in order to capture Banner. Gen. Ross oversees as he gets a small dose of the cryogenically contained serum. Blonsky is next seen leading an assault on Banner at Culver University with the speed of a gazelle and energy of a toddler jacked up on Mountain Dew and Pop Rocks! Of course, thy trap Banner and out comes the jaded giant and all hell breaks loose on campus. Bullets bounce off Hulk’s hide as he chases down soldiers and topples over tanks, tearing some in half and using shrapnel as shields and weapons as he takes on these giant sonic cannons. During the battle Betty fails to get her father to stop the madness. Blonsky stupidly tries to go one on one with Hulk which result in most of his bones being crushed despite his increased strength, speed and agility. The battle ends with Hulk saving Betty from a helicopter explosion and everyone looking gape-mouthed as he carries her away. He seeks solace with her in a cave on the side of a mountain in the Smoky Mountain National Forest. The Hulk animation was great during the chaotic campus fight but here, at night in the shadows of the cave there are times where he just looks cheap. It’s as if in these quiet scenes of down time between the action should invoke some humanity in this brute. No, it shouldn’t. Instead it just comes across as a King Kong knock-off. I know what the story is trying to convey here and I have no problem with making the Hulk a hero as long as he still comes across as a beast. I wanna believe that some of the moments of character-driven dialogue that make the film stand out are injected by co-writer Norton. There are lines of light humor that read in such a way to add a sense of reality to the story. For example, ever wonder why Hulk is always wearing purple? That gets dealt with here as well as when Banner refuses to wear bright purple stretchy-pants while on the run. It’s great to see this brought up actually. Banner is always needing pants after “hulking out” and the type of pants he needs. It’s writing like this which show that consideration is taken as to what quibbles have been voiced over the years by the audience. Undercover and on the run, Banner and Betty weave their way to a university in New York City, where they finally meet Mr. Blue. Turns out he is socially inept scientist Samuel Sterns (Tim Blake Nelson) who may be able to come up with a possible antidote yet he warns them both that the risk in testing this could be death. Banner tries it anyway and after some struggle, it looks as if the antidote serum has worked. Sterns is so geeked-out by this he reveals that he has synthesized the blood samples that Banner had been sending him into a large supply with the intention of using it to enhance the human condition to the next evolutionary level. Incensed by what Sterns had done and fearful of his blood falling into the wrong hands, Banner tries to convince Sterns to destroy it all but is suddenly shot by a tranquilizer from one of Ross’ snipers. While both Banner and Betty are taken into custody, an even more jacked-up and crazed Blonsky threatens Sterns. His super-soldier treatment has healed all his injuries but he’s still power-hungry and craves more. Sterns doesn’t argue with him and agrees that Hulk’s power is like that of a god. He subjects Blonsky to a dose of Banner’s gamma radiation treatment but warns him that the combination of the Super Soldier formula and a gamma treatment would be an unpredictable….possibly turning him into an Abomination. Blonsky could care less and mutates into a monstrous creature even stronger than the Hulk. He knocks Sterns to the floor after the process and we see an irradiated sample of Banner’s blood-derivative drip into an open wound on his temple, causing his cranium to mutate and expand. Now a monster, Blonsky rampages through Harlem, plowing down police and civilians like ants, in an attempt to draw the Hulk out. Realizing that he is the only one who can stop the monster, convinces Ross to release him. Unsure if he will even turn into the Hulk, he jumps from Ross’ helicopter hovering over the city, hoping the fall will stimulate his adrenal glands in time. Since the film is obviously gonna give us the obligatory “final smackdown” his plan succeeds, and a brutal battle ensues between the two radiated giants. Ross and Betty follow their actions from above, we see Ross call the soldiers to hep “the green one.” The two smash city streets, crawl up buildings and crash-land Ross and Betty’s chopper onto a rooftop as they duke it out. In trying to ensure Betty’s safety, The Hulk almost gets overpowered while fighting Blonsky, but his rage is stronger and he is stopped by Betty just as he is about to kill his foe. Frustrated by the whole event, a raging Hulk leaps away into the night, leaving his fallen adversary to the authorities. Later, In the aftermath of it all we see a beat-down Gen. Ross is seen drinking at a seedy bar when he is approached by Tony Stark (Robert Downey Jr.) who would like to help him with “his problem” and reveals that a “team” is being put together. Thirty-one days later, Banner is living in isolation once again, this time in Bella Coola, British Columbia. He is in a cabin in the wilderness, mediating calmly. He appears to be attempting to initiate them in a controlled manner, instead of trying to suppress his transformations. The last image we see is Banner’s eyes turning green as a grin appears on his face. Thus, we now have established a cinematic Marvel universe with this film. While it is a powerful follow-up to “Iron Man”, it couldn’t possibly be as good cuz we’re dealing with a title character who is primarily one-note, lacking Tony Stark’s wit and charisma. People will be pleased to know that the film doesn’t waste any time getting started. It’s just well-crafted and exciting craziness with just a hint of actual humanity to make it all seem kinda real. Instead of Lee’s brooding or angst, Letterier focuses more on action, tension, and a surprising amount of wit.